The following information was provided by Mr. David Frith of British Waterways. Crossing the River Goyt subsequent to ascending Marple Locks the canal crosses Marple Aqueduct. The first stone was laid without ceremony in May 1794. The arches were keyed in during 1799 and the channel filled with water in 1800. 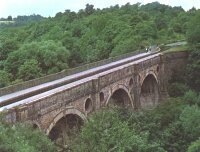 The aqueduct was designed by the Peak Forest Canal Company's consultant engineer Benjamin Outram and the resident engineer Thomas Brown. George Borrow described it in these words, "Few things are so beautiful in their origin as this canal which be it known with its locks and its aqueducts the grandest of which last is the stupendous erection near Stockport, which by the bye filled my mind when a boy with wonder, constitutes the grand work of England, and yields to nothing in the world of the kind, with the exception of the Great Canal of China." The structure is 309 feet long and comprises three arches above the River Goyt. The centre arch being 100 feet above river level. The whole structure contains some 8,000 cubic yards of masonry. The piers being oval in section and of rough red sandstone. The upper masonry carrying the water channel is of white hewn and dressed stone. The water channel was brick faced with a puddle clay backing. The contract for building the aqueduct was placed with William Broadhead, Bethel Furness and William Anderson. 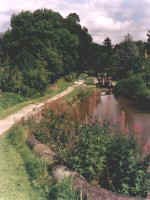 The Peak Forest Canal survived as a cargo carrying waterway until 1948. The canal had a range of ownership. In 1846 the canal was leased to the Sheffield, Ashton-under-Lyne and Manchester Railway. Later known as the Manchester Sheffield and Lincolnshire Railway, they took full control of the canal when the Peak Forest Canal company was dissolved in August 1883. With a change of name the waterway became managed by the Great Central Railway in August 1897. December 1922 saw the Great Central merged into the London North Eastern Railway. On Marple Locks at least one LNER land boundary post remains. Post war years saw the railways losing their ownership of canals and Thursday January 1st 1948 saw the railways nationalised. The canals were handed to the British Transport Commission and grouped together under the newly formed British Waterways Board. With dwindling cargo traffic, 17 tons in 1957, and little or no pleasure traffic the Peak Forest and Ashton Canal was set for closure. The Inland Waterways Protection Society was formed in 1958. Activists campaigned in 1961 when an Act was drafted to close the Ashton and Peak Forest Canals. A Whitsuntide cruise in 1969 saw several boats sailing from Marple to Fairfield. Vandalism at Lock 11 prevented most from reaching Manchester. With the Hollinwood and Stockport branches closed it seemed inevitable that the main line would also be axed by Parliamentary Act. With the Peak Forest Canal semi-derelict and used only as a water carrier to riparian industry in Manchester, little care was taken of the structures on the waterway. The only remedial work on Marple Aqueduct had been the installation of tie bars around 1912. In the winter of 1961-62 frost damage caused part of Marple Aqueduct to collapse. The damage was on the north offside, to the wall above the eastern arch on the Marple side. The engineers report described the collapse as being thirty feet long and three feet from the channel edge. It is understood that prior to the collapse large icicles were hanging from the soffit and the arch actually fell at about 2.00pm. It seems likely says the report that water from leaks in the canal had seeped into cracks in the arch where it had frozen and forced out the ring stones. A considerable quantity of water is at present running through at the collapsed area. British Waterways had a dilemma, either repair the aqueduct in its original form as a waterway or rebuild as a water carrier. Costs given for a rebuild of the original aqueduct were £32,000 or to partly demolish and build as a water carrier for £21,000. The loss of the aqueduct would be a blow to the growing numbers of canal enthusiasts. In June 1964 the inaugural meeting of the Peak Forest Canal Society was held. The campaign began to reopen Marple flight of locks and the Ashton Canal. These revitalised waterways would link with other surviving canals to create The Cheshire Ring. 1966 saw the Inland Waterways Association hold its National Rally at Marple and campaigning continued for a further five years until in 1971 the decision to reopen Marple Locks and the Ashton Canal was made at governmental level. Three years of work by activists and British Waterways finally came to fruition on Monday, May 13th 1974 when Dennis Howell MP. Minister of State at the Department of the Environment sailed up from Manchester on cruiser Telford and cut the ribbon across Lock 2 at Vesta Street, Ancoats. Accompanying him on the boat was Sir Frank Price Chairman of BWB and the Lord Mayor and Lady Mayoress of Manchester. A plaque was unveiled and a second identical plaque was later unveiled at Marple Top Lock. British Waterways organised a Silver Celebration to publicise these anniversaries. Pennine Waterways Website Main Entrance or go to the Peak Forest Canal Section directly.